Anonymous roses in the Moosey garden cannot be ignored. It isn't their fault that they are nameless. Often garden plants are rescued from bargain bins and sale tables at the local nurseries, and come to live in the Moosey garden. Others are offered a good home in the country from existing gardens - I've gained many of my treasures this way. The Head Gardener hates the 'look' of white labels hanging from a low stem of a newly arrived rose bush. There are boxfuls of these old labels in the house, but alas the position of the rose in question was never written down. Then there is a group of roses which were already here when we first came to Mooseys. Some of these are well known, but others could be any rose! The original garden was planted in the 1980s, and I don't really know which roses were fashionable in New Zealand then. So rather than stare at the photographs in my rose book and try and match my roses up, I've decided to let the anonymous roses have their own section. There's no shame in not knowing your name, if you're a rose! I like rescuing and recycling suburban roses from older gardens. I call them my 'retro roses' - hybrid teas from decades long gone, when scary chemicals ensured rose health, and rose pruning was an elitist activity for the (possibly male) experts. I offer a good country home to recycled roses. People gift them (they're often free) if I'm prepared to turn up with my gardening gloves, secateurs, and shovel - and take them away. Here's yet another unknown pink rose - but this one's a peach! I do have the best excuse for not knowing its name - it was here when we came to Mooseys, all those years ago. Like many gardeners, I often don't listen properly when I'm being given some free plants - particularly if there are lots coming my way. 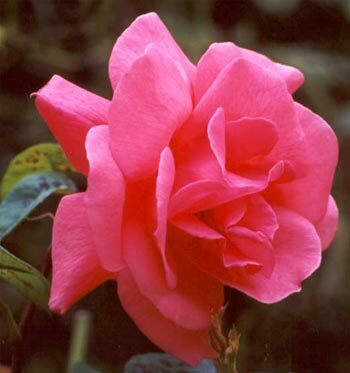 Many of my rose names are unknown as a result of my inattention. This lovely ivory-cream rose was gifted to Mooseys from a gardening friend. I can't think why she wanted to get rid of it - the rose has shown no signs of ill-health, forming a medium-tall compact shrub with lots of flowers. Is it The Dove? My garden is full of unknown pink roses. Some came without labels, others were here when I arrived. There's no easy way to identify them, and it's best that I keep my guesses to myself!